Will ConocoPhillips Raise Its Dividend in 2017? After a 2016 dividend cut, investors hope the oil giant will reverse course this year. Energy companies have gone through a lot of turmoil lately, and ConocoPhillips (NYSE:COP) hasn't been immune from the impact of plunging oil prices on its profits. Early last year, ConocoPhillips slashed its dividend, doing an about-face after having reassured investors that it remained committed to sustaining its payout. Now that crude oil has rebounded, some hope that ConocoPhillips will be able to return to its upward trajectory with its quarterly dividends. Let's look more closely to see whether ConocoPhillips is likely to hike its payout in 2017. Source: Yahoo! Finance. Last increase refers to ex-dividend date. N/M = not meaningful; ConocoPhillips had negative earnings over the past 12 months. 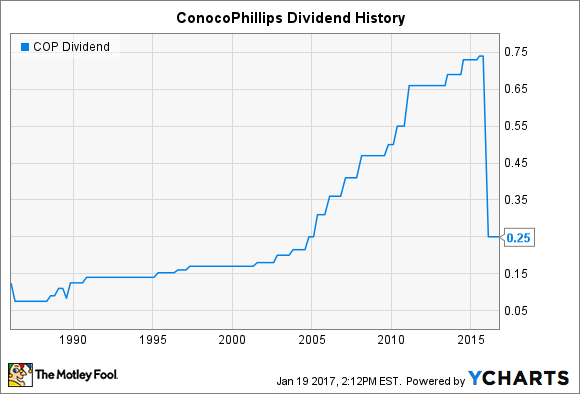 Until last year, ConocoPhillips had been a resolute dividend payer, sustaining and growing its payout over time through good times and bad. Before its merger with Conoco, Phillips Petroleum was an integrated oil and gas company that includes exploration and production capacity, crude oil pipelines, refinery operations, and marketing facilities. In part because of the broad-based exposure, Phillips was able to enjoy more stable performance that pure exploration and production plays, and that helped to support regular dividend growth. Following the merger of Conoco and Phillips in 2002, dividend growth accelerated dramatically. Steady gains in the commodities markets supported higher profits, and overall economic growth across the world increased demand for refined products. Over time, market participants began to see the value of refinery operations, and ConocoPhillips followed the trend of many integrated oil companies in spinning off its midstream and downstream assets to make the company a pure-play exploration and production company once again. In hindsight, the spinoff turned out to be ill-timed, as it left ConocoPhillips fully exposed to the ensuing plunge in crude oil prices. In 2014, 2015, and 2016, Phillips 66 (NYSE:PSX) was able to provide double-digit percentage increases in its dividend, as profitability for midstream operations held up far better than corresponding bottom-line results exploration and production specialists. Still, ConocoPhillips held out longer than many oil and gas exploration and production companies. During 2015, huge declines in crude led many companies to cut their dividends, but ConocoPhillips initially remained resolutely opposed to any reductions. By early 2016, however, even more dramatic reductions finally led company executives to say that they would need to account for extremely low oil prices for the long run, and that led them to do a reduction of nearly two-thirds in ConocoPhillips' dividend. What's ahead for ConocoPhillips dividend? ConocoPhillips investors have some reason for hope. Oil prices have nearly doubled from their worst levels in 2016, and while $50 to $55 per barrel oil isn't nearly as strong as it was in past years, it nevertheless should stop the flow of red ink from asset impairments going forward. Moreover, company leaders have said that even $50 oil could be enough to help it balance competing priorities for its capital, and dividend increases could follow as part of ConocoPhillips' overall capital strategy. That said, shareholders shouldn't count on ConocoPhillips being able to move quickly enough on that front to deliver a dividend increase within the next several months. Typically, ConocoPhillips used to make dividend increases near mid-year, and that might prove too soon for the company to have enough confidence in its future performance to make even a token increase to its quarterly payout. Given enough time, however, it's likely that the oil giant will find a way to move its dividend upward and get back on the growth trajectory that ConocoPhillips enjoyed for so long.